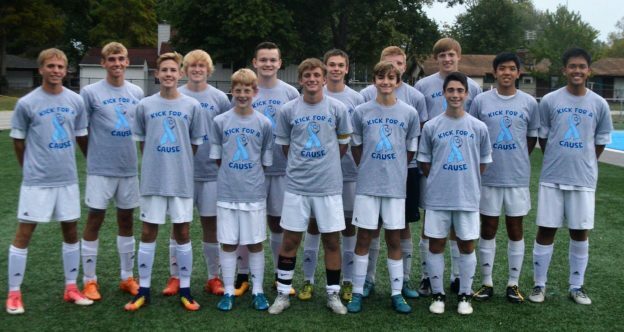 Mater Dei varsity soccer players are pictured prior to their Kick for a Cause game held October 4. From shirt, ticket and food sales, the event raised $920 for Camp Oasis, which offers children with Crohn’s or Colitis Disease the opportunity to simply be a kid for a week in the summer. Mater Dei senior soccer player Bobby Clancy (back row, fourth from left), who has experienced multiple surgeries and hospital stays as he battles Ulcerative Colitis, volunteers as a Leader-in-Training (LIT) at Camp Oasis. Thank you to all who supported the Kick for a Cause!